The purpose, promise and peril of interfaith engagement. Similar scenes—some ancient, some as recent as yesterday’s newspaper—have been arranged in a host of ways with a variety of religious identities. No religious tradition can claim a monopoly on compassionate courage. And yet such snapshots remain rare. A recent magazine ad for a large U.S. stock brokerage firm features a stunning photograph of the Earth taken from space. Superimposed over that image is the phrase “WORLD PEACE IS GOOD.” And then the ad continues: “But finding a stock at 5 that goes to 200 is better.” This glimpse of cynicism gives us some idea of the economic and emotional forces we’re up against when we try to work for genuine peace. If the effort to foster understanding and relationships across religious lines is to be more than a cosmopolitan hobby, if it is to become a substantial and sustainable movement, expanding the base is essential. New and renewed strategies and resources are important, as is provoking the kind of imagination that will support costly action. Both these goals require clarifying the purpose and promise, as well as the peril, of interfaith engagement. This revised and expanded version of Peace Primer is being offered in the conviction that interfaith dialogue and collaboration are both possible and urgent. Much has already occurred, and we celebrate, remember and support those inspired individuals and organizations that have led the way. Solidarity in human dignity across apparent boundaries of separation has long been practiced by many people of conscience, in many times and places, though the phenomenon has rarely been afforded the public attention we believe it deserves. Still, plenty of documentation exists. The purpose of interfaith conversation is not to have exotic friends or engage in literate conversation at dinner parties. The purpose of crossing these boundaries is to affirm the God of Creation, the God of Humanity, in the face of rampant efforts to debase both creation and humanity—efforts that are generally defended with reference to some divinized “greater good.” Far too often, such efforts seek to bolster themselves with religious legitimacy of some kind. Coalitions of religious adherents of every sort are therefore needed to mount resistance to the “myth of redemptive violence,” as theologian Walter Wink called it—that most enduring of human miscalculations. Besides saying no to religiously sanctioned violence, multi-faith groups also need to say yes to the policies of justice that prepare the ground for a harvest of peace, by means of institutions that serve the common good rather than the “greater good.” Such policies are forged in the very heart of religious faith. Only a politics of forgiveness and human dignity has the power to free the future from being determined by the failures of the past, to make space for hope. Conflict mediation specialist Byron Bland has written that two truths make healthy community difficult: that the past cannot be undone, and that the future cannot be controlled. However, two counterforces are available to address these destructive tendencies: the practice of forgiveness, which has the power to change the logic of the past; and covenant-making, which creates islands of stability and reliability in a faithless, sometimes ruthless world. A third counterforce also calls out to be deployed: the exhilaration of our discovery of the usefulness of human difference. Religious communities have unique resources to foster politically realistic alternatives to policies of vengeance and to shape civic discourse in ways that free communities and nations from cycles of violence. When faith communities actively acknowledge one another’s gifts, the whole is far greater than the sum of its parts. This acknowledgement is essential. For in addition to the purpose and promise of interfaith engagement, there is also a peril that must be avoided. Interfaith dialogue too often presumes that for progress to be made, distinctive faith claims must be abolished, distinctive practices muted. Part of the shadow side of modernism is its tendency to reduce everything to common denominators. There is a kind of cultural imperialism in this purported “universalism.” Interfaith advocates have a tendency to become culture vultures, picking a little from this tradition, a little from that—whatever looks and feels good at the time. Severed from particular disciplines, historic memory and communal commitments, this kind of freeze-dried spirituality offers sugary nutrition that stimulates but does not and cannot sustain healthy institutions. Politically speaking, the result of this intellectual fickleness isolates progressives from traditional cultures of faith and from the very communities whose collective weight must be brought to bear on our wanton, promiscuous state of affairs, where vulgar enthusiasm for personal gain forever seems to trump the commonwealth. It has been said that in a drought-stricken land it does little good to dig many shallow wells. We believe that the way forward for interfaith engagement will acknowledge at the outset that energizing interreligious collaboration does not mean homogenizing faith. Of course, that does not mean we shall remain unchanged. But we will be pushed to trust that the Center of our adoration, however that reality is named, is greater than the limits of our comprehension. In the end, such delight and joy—some say reverence—is the only power that will sustain the risks to be endured. Rabbi Lynn Gottlieb, author of She Who Dwells Within: A Feminist Vision of Renewed Judaism, is coordinator, Shomer Shalom Network for Jewish Nonviolence, Berkeley, CA. Her book, Trail Guide to the Torah of Nonviolence, will be published by September 2012. Chaplain Rabia Terri Harris is a teacher and student of transformational Islam. Founder of the Muslim Peace Fellowship in 1994, she is president of the Association of Muslim Chaplains and a scholar in residence at the Community of Living Traditions. Rev. Ken Sehested, author of In the Land of the Living: Prayers personal and public, is co-pastor of Circle of Mercy in Asheville, NC. An award-winning writer, he was the founding director in 1984 of the Baptist Peace Fellowship of North America. 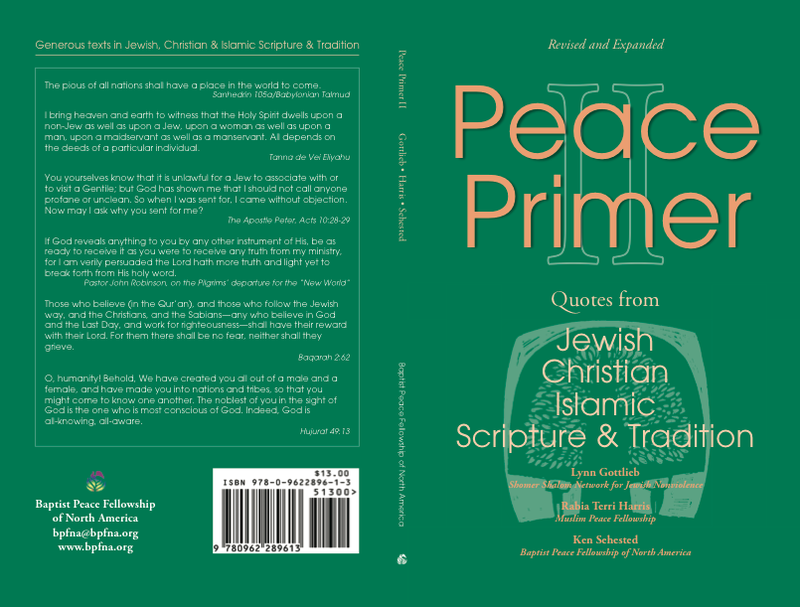 “Speak up loudly, pay up personally: The purpose, the promise, and the peril of interfaith engagement” is excerpted from Peace Primer II: Quotes from Jewish, Christian and Islamic Scripture and Tradition, published in June 2012 by the Baptist Peace Fellowship of North America (bpfna.org). For permission to reprint this article, contact Evelyn Hanneman, Baptist Peace Fellowship of North America, 704.521-6051, evelyn@bpfna.org.